As a concept The Noble Lie was launched by Plato through Socrates. It is Socrates who in The Republic explains the idea in a long confusing analogy. Essentially, according to Plato's Socrates, the lie is that all of us belong to the same family of men. By spreading this lie, the ruler makes sure that citizens are willing to take care of each other like brothers.-- However, instead of "lie" some lucid translators opted for "myth". The idea that we are all brothers is of course not a lie, not a falsehood, no deception. It is simply all there is, a metaphor, a façon de parler reflecting what is believed or naturally taken for granted by most people. You can take it or leave it, but there is nothing else. All explanations are necessarily figurative; they are pictures to explain life or pain or death or "fate" or art, justice, beauty, love, evil, the soul, the mind, everything: even a painting, or a piece of music; and that is why many people have to leave it at LOL and WOW. Besides, Plato's simile is too complicated and clumsy with its enumeration of souls made of brass, silver, gold. It makes me blush to think that Plato wrote it. I do not believe he did, for it does very much read like the prose of half a dozen philosophy professors amending each other. 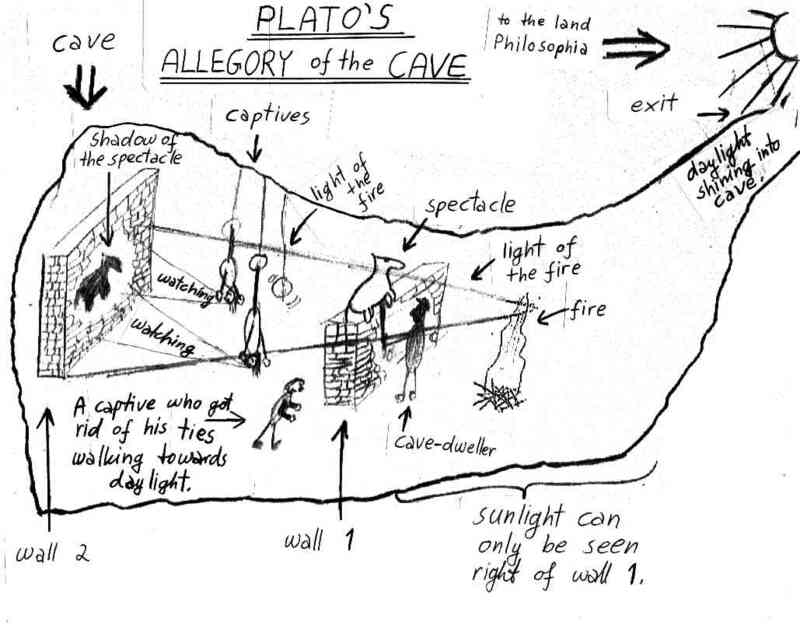 In fact, it is almost as bad as Plato's Cave analogy which is so confusing that some good people have tried to illustrate it. And yet, even with the help of some drawings, there are readers like myself who have to give up and simply retain that the cave-dwellers get only shadows of what is ouside. This is what happened to Plato's Noble Myth. The people surrounding Bush and Cheney may have looked at the original text, found it too complex, but spotted the term Noble Lie, and they milked it for all it is worth, unaware of its original intention. In this story, where does Leo Strauss come in? Leo Strauss mentions it in his The City and Man which has to be read over several weeks or not at all. For Wolfowitz, who studied under Strauss, the term comes in handy when he serves under Bush whose gut feeling*** it is that Iraq has to be invaded soon. Strauss never dealt in lies. 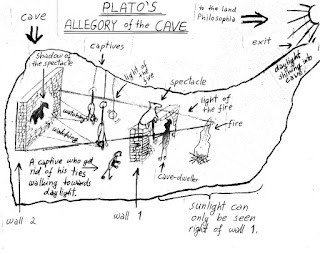 Quote Leo Strauss on Plato: "Being a philosopher, that is, hating "the lie in the soul" more than anything else[.....]"
Plato's explanation of the cave and the noble lie are similes or analogies. The sayings that we are brothers or that the gods wanted some of us to be stronger than others are metaphors. The difference: metaphors are used to create subjective (personal) depth whereas analogies are used to explain logical or rational connections. In other words. metaphors are made with a subjective intention, whereas analogies are mainly for clarification. So the basic difference is not necessarily in whether "like" is used. I saw the coplete quote only yesterday, and saw it in my own files. Basically he says that some men's souls are made of gold, some of silver, others of brass, and the golden souls are leaders, etc, and brass is workers. That is, well, let's say, odd. But he seems to have added that if your child shows signs of not coming up to snuff, then, no pity, just throw him out! ". . While all of you, in the city, are brothers, we will say in our tale, yet god, in fashioning those of you who are fitted to hold rule, mingled gold in their generation, for which reason they are the most precious — but in the helpers, silver, and iron and brass in the farmers and other craftsmen. ( ...) So that the first and chief injunction that the god lays upon the rulers is ( ...) to be such careful guardians( ...) of the intermixture of these metals in the souls of their offspring, and if sons are born to them with an infusion of brass or iron they shall by no means give way to pity in their treatment of them, but shall assign to each the status due to his nature and thrust them out among the artisans or the farmers. This is his noble lie: "a contrivance for one of those falsehoods that come into being in case of need, of which we were just now talking, some noble one. . . ."
The Greeks were much more influential than is generally known. It is as if they had fabricated many of the instruments that actually allow us to think. As far as I know, in Islam, too, they seem to have studied Plato and Aristoteles even before the Europeans had access to them. So a modern reader who quibbles with a concept possibly developed by Plato is like the leaf of a tree quibbling with the branch that holds it.